One of my girlfriends is going to Paris next month. While I don’t know what clothes she’s planning to take, I saw these Cuyana pieces and thought of her. They’re timeless and versatile, and since they’re neutrals, she could mix them with almost any color. I like Cuyana because they design timeless, quality pieces that will stay in our wardrobe forever, and you can add a little something new each year, like a different scarf, purse or jewelry, to give them a fresh new look. Cuyana believes in “intentional buying,” that less is more when it comes to what hangs in our closet. When have you heard of a clothing brand telling you to buy selectively as opposed to buying everything they have? Layering is the key to building a small, yet versatile travel wardrobe. Whether we’re on an airplane, in a restaurant or a museum, or we’re walking through a Paris neighborhood, a cape/a poncho is indespensible. 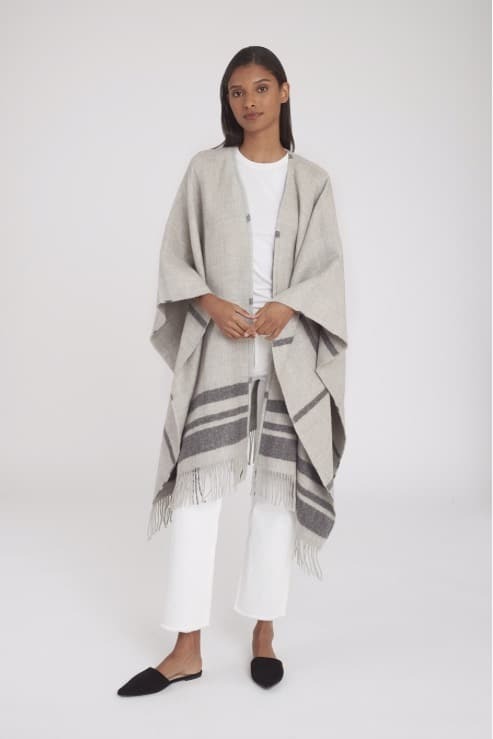 This cape from Cuyana is 100%, soft baby alpaca and is double faced with checks on one side and stripes on the other. …or throw it over your outer jacket or trench coat This trench also comes in black. Once inside a restaurant, you can drape the cape over your shoulders to keep you warm. 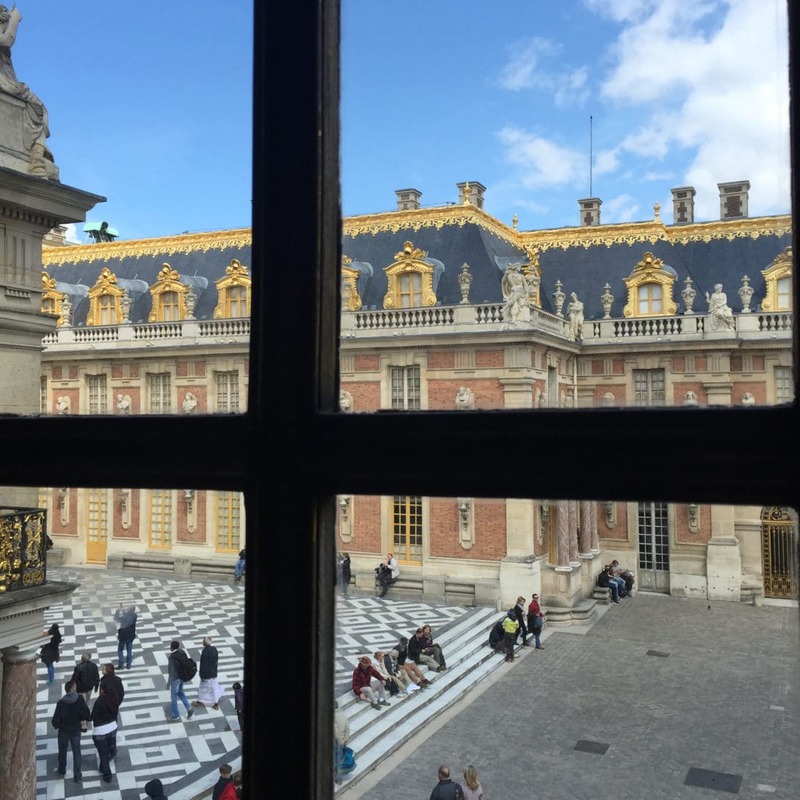 A cape is a must when traveling especially in months, like March, when it will still be cold, and if you haven’t been there this time of year… Versailles will be cold. 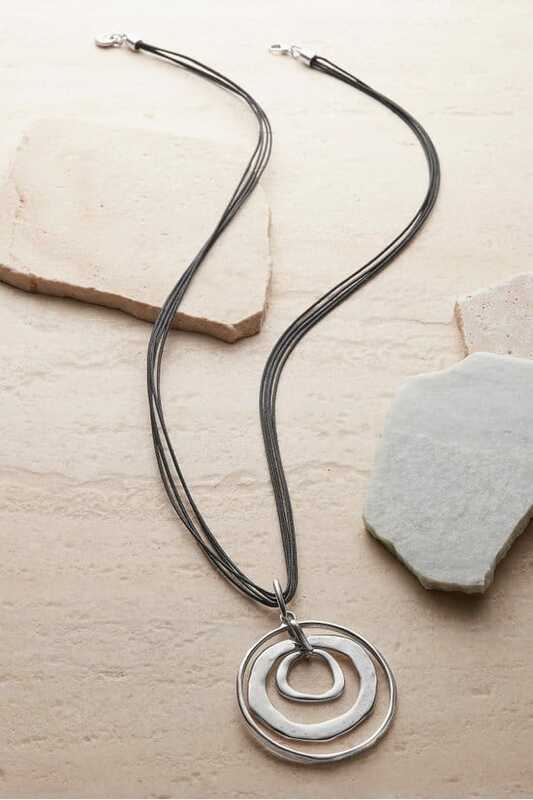 …and this hand hammered, silver-tone necklace on black cords from Soft Surroundings. You’ll look like a Parisian! 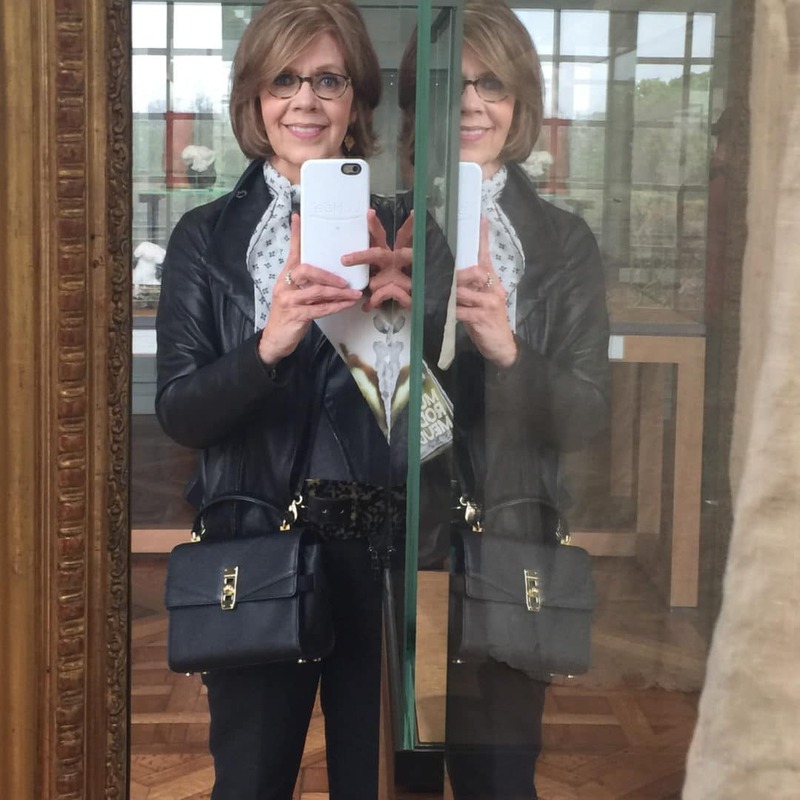 This is me at the Rodin Museum in Paris three years ago. 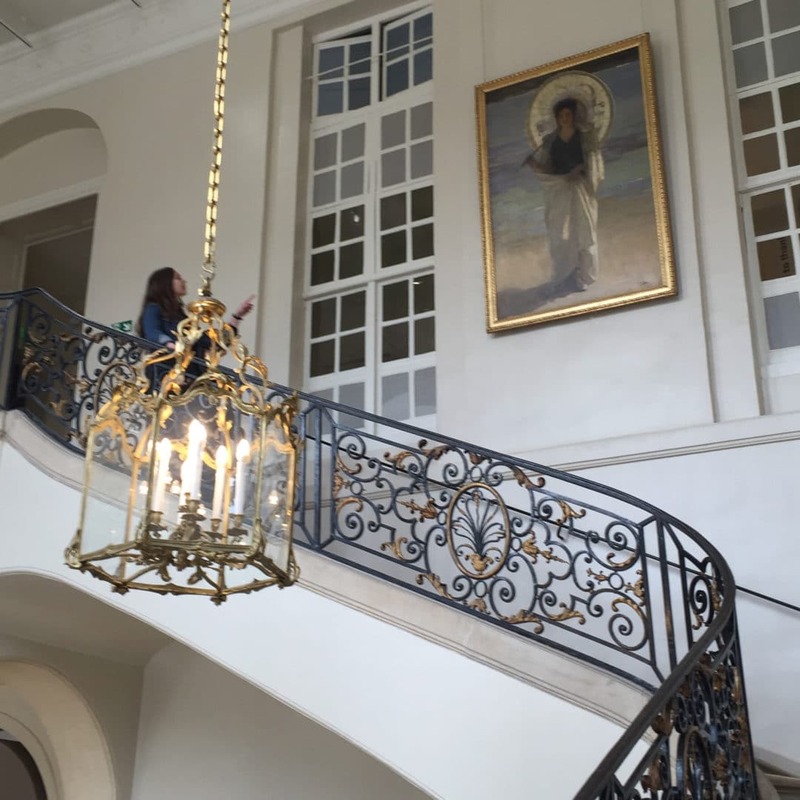 My back and shoulders don’t like the weight of a big tote while I’m walking through a museum or an historic sight, and because they’re open at the top, it’s easy for a thief to reach in and steal your belongings. Also some museums have size limits on bags and/or make you check your bag before entering. This saddle bag is a great size—9″ x 11″—about the same size as my bag and has enough room for a guide book, credit cards, cash, makeup and glasses. 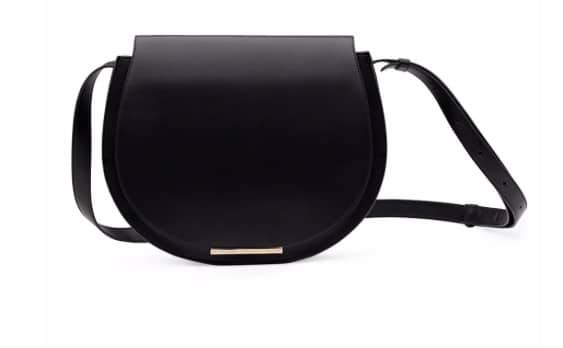 It comes in black and caramel, has lots of interior zip pockets and the shoulder strap adjusts easily. 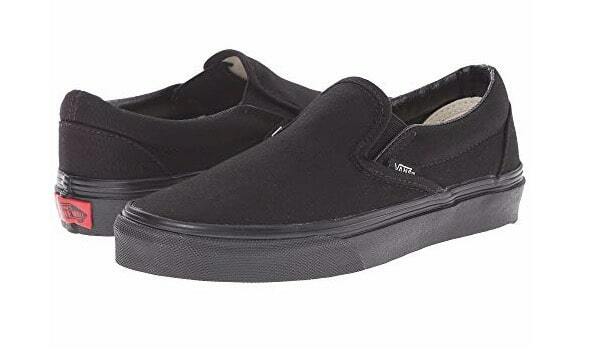 You’ll also need a great walking shoe, like Vans Classic Slip-on, and a pair of flats or ankle boots. 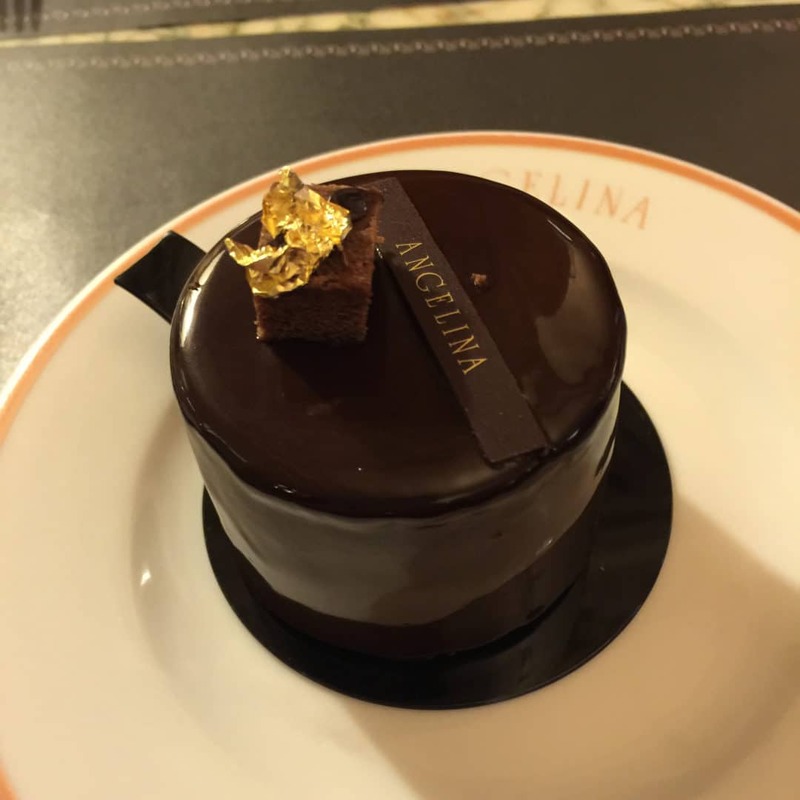 …have dessert at Angelina’s and drinks at the George V Hotel. Have fun in Paris, girlfriend. Bon Voyage! I have a cape that I bought many years ago. Nothing like a cape for drama! I took it with me to the U.S. on one trip, and ended up leaving it with my mom–she had such trouble getting in and out of her coat with reduced flexibility in her shoulders. Plus, she used a wheelchair to go long distances and had to get her coat wrapped just right before sitting down–not easy because it was hard enough for her to get into the wheelchair. The cape made it so simple. And the downside of the cape–that it’s loose and wind blows into it–were negated in the wheelchair, where it was like wrapping her in a blanket. If you have an elderly relative, consider gifting them a cape. My mother died not long after that trip. Now when I wear the cape I don’t think of the many years I had it before but I think of her. Everytime I travel especially on a plane I wear a cape or large cashmere scarf. I hate those blankets on the planes and a cape is so much more stylish. I adore that coat. I’ll definitely look for one for myself. Thanks Brenda! A cape is a great idea for cool days in Paris. I also like a cashmere pashima because I like to keep my neck warm on chilly days. DID you see my AGELESS STYLE POST on Penelope Bianchi?SHE WEARS THAT BRAND and LOVES THE TURTLENECKS! My traveling DAYS are at a STAND still for the moment YOU KNOW WHY! That Trench Coat is a beauty!! Actually, everything is lovely. Being petite, I always feel swamped in capes and ponchos… so I opt for shawls and pashminas. Do capes come scaled for us shorties, do you think?? Beautiful classic pieces. Love to have the cape.